I’m getting to this late, but the New York Times’ David Leonhardt and Mother Jones’ Kevin Drum started a discussion earlier this week on whether a social safety net –especially the availability of health insurance– could actually promote entrepreneurship in the United States. Still, I remain curious about the Leonhardt argument, which is a common one in the liberal community. Is it true? Does knowing that you have a safety net make you more likely to get up on the trapeze and try something risky and new? The analogy is wonderful, but that doesn’t make it true. Surely, though, this is a testable hypothesis? Not a provable one, of course, but one where evidence can be amassed on different fronts based on measurements of social safety nets in different times and places vs. risk-taking behavior in different times and places. Has anyone ever done this? The short answer is yes, economists have looked at this issue, and the evidence generally supports the view that a safety net supports self-employment and small businesses. Nathan Lane and I provided some indirect evidence of this in a paper we wrote for CEPR in the summer of 2009 (“An International Comparison of Small Business Employment” (pdf)). 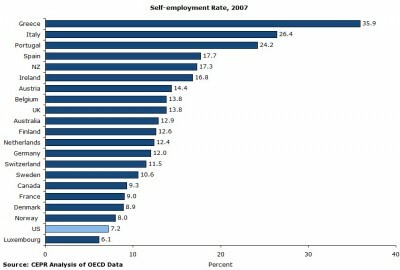 For rich countries with roughly comparable economies, the United States consistently has among the lowest levels of self-employment and small-business employment. For example, using data from the Organization for Economic Cooperation and Development (OECD), the United States has the lowest level of self-employment (except Luxembourg). 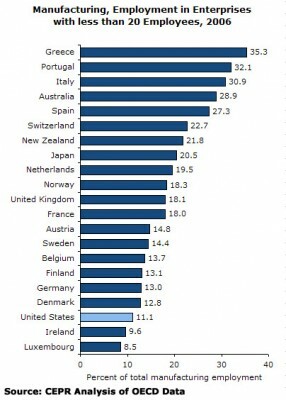 The US data here may not be directly comparable with the data in the other countries, but even after making adjustments for this, the United States only rises to somewhere just above France and still below Sweden. Source: Schmitt and Lane, CEPR. There are no internationally comparable data on economy-wide small-business employment, but the OECD does publish estimates for a large selection of broad industry groups. 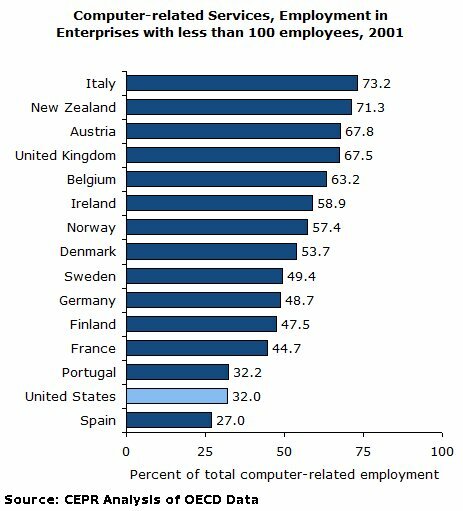 In those data, the United States is near the bottom when it comes to small-business employment in manufacturing (here defined as fewer than 20 employees, but the same holds for all larger cutoffs in the OECD data). The same holds for high-tech services, too. Here are the data for “computer-related services” using a cutoff of 100 or fewer employees. Economists have also looked at the connection between health insurance and entrepreneurship more formally. Probably the best, and certainly the most recent work is by Robert Fairlie, Kanika Kapur, and Susan Gates, who have a September 2010 RAND Working Paper called “Is Employer-Based Health Insurance A Barrier To Entrepreneurship?” Their answer: yes, it sure looks that way. Second, Fairlie, Kapur, and Gates find that men just over age 65 –and therefore eligible for Medicare– are more likely to be self-employed than otherwise similar men just under age 65 –and therefore not yet eligible for Medicare. Medicare seems to be unleashing the entrepreneurial talents of new seniors. Imagine what “Medicare for All” might do. UPDATE 10/06/13: James Surowiecki cites our paper in his Financial Page column on “The Business End of Obamacare” in The New Yorker. I imagine it would bankrupt the country a few years sooner. An optional catastrophic health coverage plan provided by the government could be provided cheaply and efficiently, and help prevent America from becoming just one more banana republic so dearly wished for by banana Republicans. Finally someone is thinking about a bigger possibly positive outcome!Image the freedom of not staying at a job you hate simply because of benefits… the pursuit of happiness. What a concept. We have some direct experience of this. I have been self-employed for some years now, and our family had always relied on my husband’s employer-provided health insurance. When my husband wanted to start his own business a few years ago, our first concern was health insurance. When I say it was our first concern, I want to be clear that he would not have started a business if we had not found a solution to this problem. We were lucky in three ways: 1) we are young and healthy, 2) we live in California where COBRA and Cal-COBRA are valid options for a total of three years, and 3) by California law, any business with two or more employees is eligible for health insurance. Between the three, we were able to make it work. Because we were young and healthy, we were able to get somewhat expensive insurance for ourselves as employees of husband’s business. Had we been other than healthy, we could not have afforded it, but it would still have been possible to take COBRA and run the business for three years before one of us found other employment with health insurance benefits. I know this is a lot of detail, but I just want to emphasize that in our culture you absolutely have to have health insurance, that it is not always easy to obtain health insurance on your own, and that, yes, these factors do stifle entrepreneurship. Since our taxation system is mostly based on the flow of money, encouraging entrepreneurship and speeding that flow might very well offset the cost of providing health insurance or of regulating health insurance so that everyone–even people who have had the bad luck to have a major illness or accident at some point–can have assured access to insurance and to healthcare. There is no way my husband could have started his business if anyone in our family had ever been really sick. yes, i moved to Australia 14 years ago or so, and the ‘safety net’ in this country (including health care) has supported my taking a number of risks in business and starting businesses that i would not have otherwise undertaken. also, the supporting of employment in the ‘social’ sector is another ‘net’ that has supported these risks; ie the fair payment of social workers for instance. True entrepreneurs don’t waste their money on health insurance or see physicians. They know better and so would every one else if they paid the premiums for the scam insurance system that feeds the useless healthcare system in America. Have your thought about including some social bookmark buttons to your web site web site? At the very least add one for Digg so we are able to digg you up!